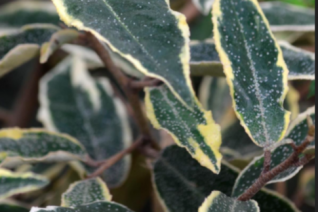 Fantastic compact and variegated Eleagnus that is also very stable and not prone to leaf reversion- many variegated cultivars revert rather easily to all green. To just 6′ x 6′ and dense in 6 years each olive green leaf is margined in light yellow. In autumn small off white pendant flowers are intensely fragrant. They occur on older growth- prune in late fall after flowering has ended. Slow growing and a good scale for small gardens. Full sun to quite a bit of shade. Striking evergreen that is easy to grow, cold hardy and long lived. Light summer water once established but endures no water summer drought conditions. Avoid boggy sites. 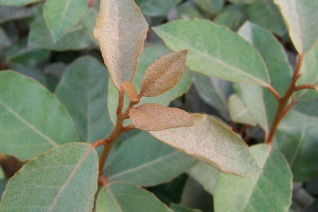 Easy, beautiful, cold tolerant shrub. Long lived.